Who doesn’t like Brad Pitt or at least appreciate his acting in one of the many movies he has made? For me, all-time favourite is “Seven Years in Tibet”. Watching it on TV or on DVD, astonished me about such a world far far away. The history, the nature and the people of Tibet are truly mesmerizing and made a lifelong impression. If you haven’t seen the movie yet, make sure to pick up a copy and poor yourself a nice cup of (butter) tea and enjoy it. I didn’t have 7 years in Tibet, but here is my 7 days in Tibet itinerary. This posts contains sponsored links and affiliate links. Rolling away from Beijing West train station was a relief. I didn’t really like Beijing, but managed to change my disappointment and make something out of my stay. But I looked very much forward to travel to Tibet. And honestly, I didn’t have a single clue as to what to expect. Sure.. high altitude, Buddhism and some really different scenery but as soon as the train entered the Tibetan High Plateau, I was amazed. Nothing but giant mountains, snow topped peaks, green valleys and those weird, funny and daunting Yaks grazing along the tracks. As you can read in my how to travel to Tibet for solo travellers, travelling by train is the wisest way to travel. But, it’s also the most superb way to travel. Spending a day at high altitude with the prettiest landscape is a good way to start your Tibetan adventure! Lhasa really is a city you will not encounter very quickly elsewhere. I got off the train at Lhasa train station. Nothing but neat, crisp and fresh pavement. Neon signs telling you were to go and everything is so modern. Taking a taxi into the city centre, took me via wide lanes, past tall hotels and designer stores. Designer stores? What..? I didn’t know which way to look first. This was nothing like I imagined. Everything was so new and modern, where was the magic and spiritual Lhasa? On the first night, I did have a good encounter with a yak. I’m no vegetarian and I love my meat. Being on the road/rails for a while had me hungry for a real big meal and I ended up at a Tibetan restaurant where I indulged on the local special of Yak meat. Owh the sweet and savoury dish! Best meal of the whole trip. So I sure can recommend eating some yak meat, steak or burger, it doesn’t matter, it’s all equally delicious. Lhasa is one of the highest cities in the world and at 3,490 metres (11,450 ft) you definitely run into some form of altitude sickness. The first flight of stairs after arriving had me panting for a good 5 minutes. My first night I had trouble falling asleep, mainly due to the headache that occurs at high altitude. But also, because I was ecstatic about being in Tibet. I made my dream come true! I wanted to come to Tibet and here I was. The next day, I wander of and find myself in front of the Potala Palace once more. 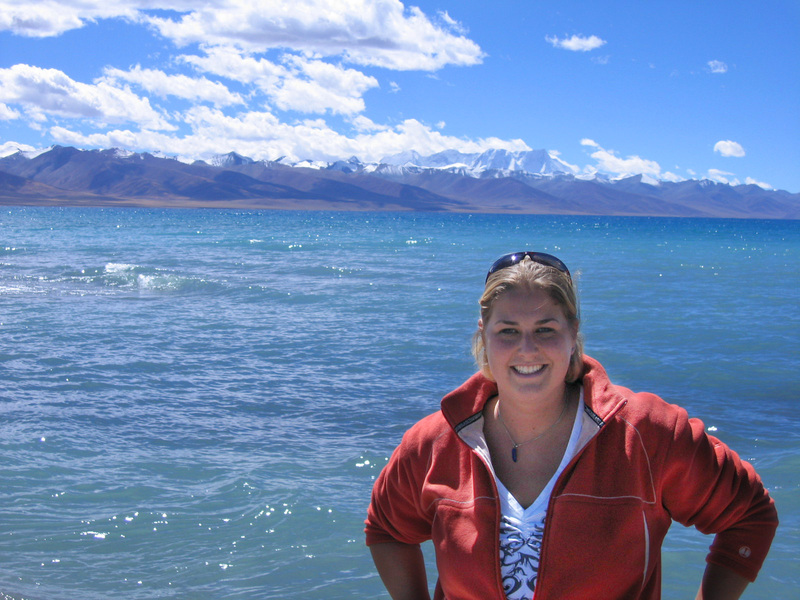 All the things you read in those blogs: What to do in Tibet? Things to know about Tibet? The main advice is: never visit the Potala Palace on the first day. You need to acclimatise yourself to the high altitude before climbing all those steps. But, I was there, they let me in and I was taking it slow. Step by step, I climbed to the top of the Potala Palace. Once it was the residence of the Dalai Lama, now it’s a Chinese museum. You can visit some rooms and see some shrines for previous Dalai Lamas. In my humble opinion, the inside of the Palace wasn’t really worth the visit. The space was crawling with Chinese guards and most of the rooms lacked some sort of spirit and soul. The outside though, is really worth your time. 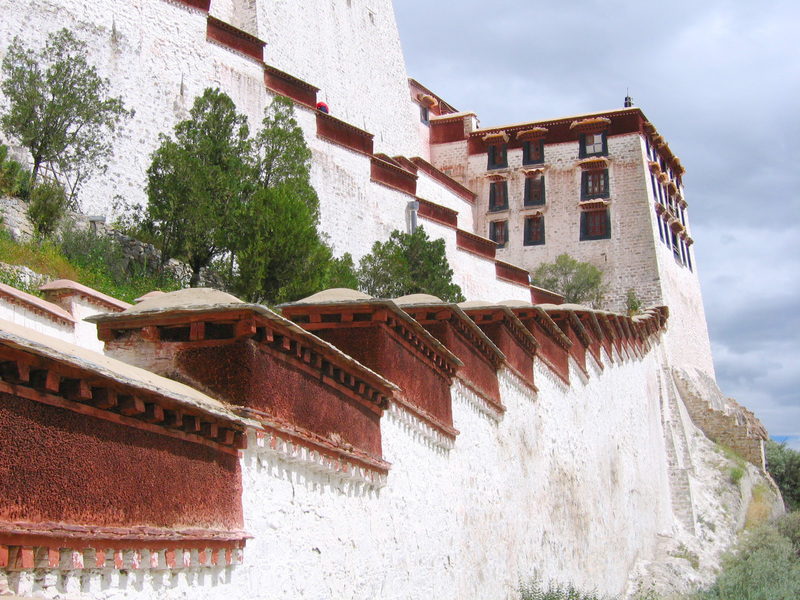 The Potala Palace is built against a hill and consists of the white palace and the red palace. It’s such a stark contrast against Lhasa’s bright blue skies. It’s a great place to wander around on your way to the top. You’ll likely encounter many Tibetans visiting the place. Sometimes I wondered who was looking at who? The people in their lovely tradition clothes caught my eye, but they were gawking at me, taking my hand, wanting to be in a picture. With me? Ehj? Once you have visited the Palace, you’ll leave the hill at the back end and you can walk around it, back to the front. There is a little hill to the left of the palace, where you pay a small fee for that amazing selfie with the Palace in the background. Ok, it’s touristic like tour groups in Paris, but it really is your must have photo opt. 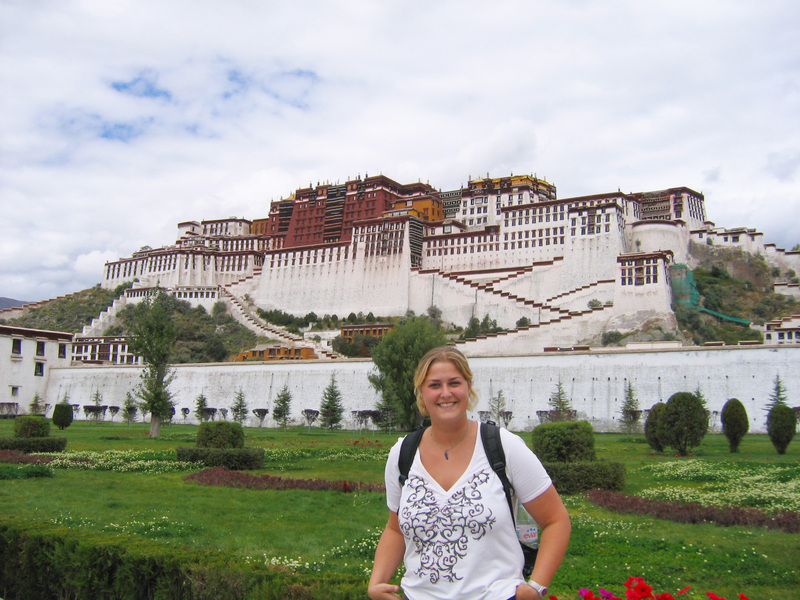 Did you visit the Potala Palace on your first day in Tibet too? What did you think about the atmosphere inside the Palace? Share your thoughts with me in the comment section below. Walking into the other direction from the Potala Palace, I soon hit Barkhor Square. There isn’t a road sign, telling you it’s Barkhor Square. But you really don’t need one to tell you, you’re in the right spot. Street vendors selling everything for the house, on the road and souvenir trinkets. Soap, butter, knifes, boots, doorbells and prayer flags. They have it. I was just following the masses when I found myself in front of the Jokhang temple. There was so much to see and look at, but most noticeable was the smell. A mixture of Yak butter burning, incense and dirt. And colours everywhere, the yellow/green/blue/red prayer flags, the monks in red robes, the children running around in hot pink outfits. 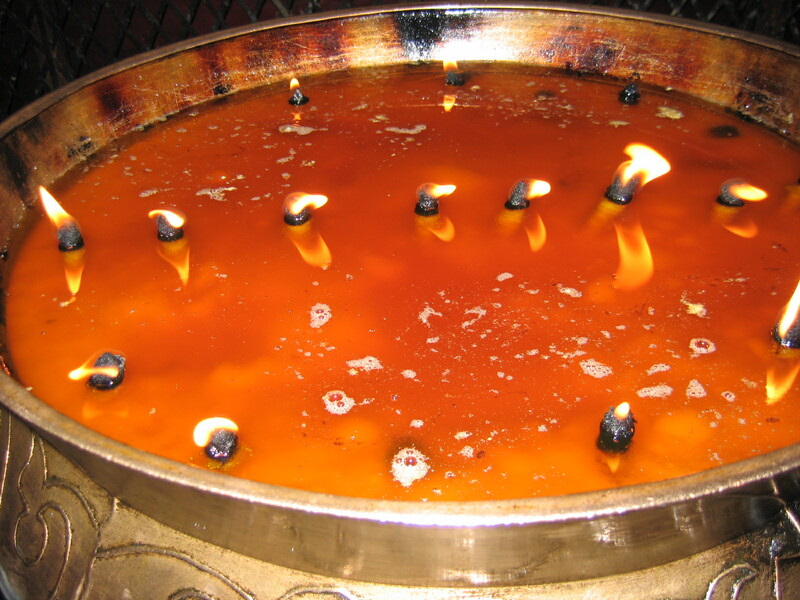 The smouldering cauldrons, the turning prayer wheels and the mumbling of pilgrims, saying their prayers. It was all a bit much to take in. I decided to sit back and treat myself to a little snack and drink. I took a seat at one of the rooftop terraces across the temple and just looked down at the people. 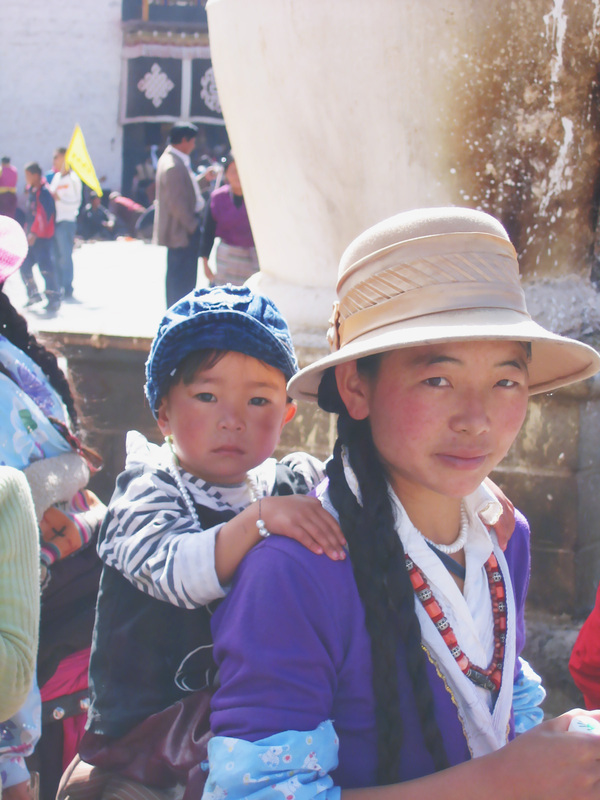 Young and old, Tibetans from Lhasa and people travelling far and wide to get to the sacred city. Also many Chinese people and tourists crossing the square. I decided to walk the kora and see what was going on. 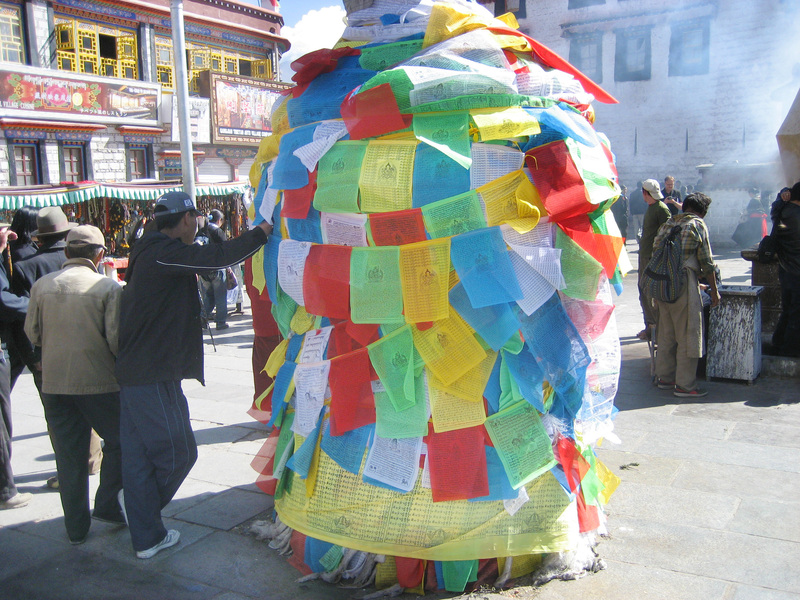 The kora is a circumambulation route around the Jokhang temple. Many Tibetans and pilgrims from afar walk it and I joined in. When I see an old lady with parchment skin prostrating the route, I stop. I cannot help but look at this tiny human. With closed eyes, she puts her hands in front of her, mumbles her prayers and puts her hand on the street in front of her. She stretches herself out, on the street, her forehead touching her hands. She gets up, takes a step forward to where her hands were a minute before and repeats the whole ritual again. She is utterly devoted, unaware of all the chaos that surrounds her. She is here, in the moment, doing her thing. I feel touched as to witness such devotion and faithfulness. Although I feel slightly guilty for looking at her, watching her moves and ways, I cannot help myself. I try not to be in anybody’s way and I return all the smiles and waves people give me. It’s a long journey around the temple, as there is so much going on. I almost bought a handmade leather saddle. But I do not own a horse so instead I settled for some colourful prayer flags instead. I had my mind set on those prayer flags from the start of my trip. I wanted to take one sting of flags with me, and leave them somewhere along the road towards Nepal. To leave something of myself behind and hopefully have my own private and selfish prayers be answered according to the tradition. The other lint of flags I’ll take home as a souvenir. Until this day, I still have it at my home. 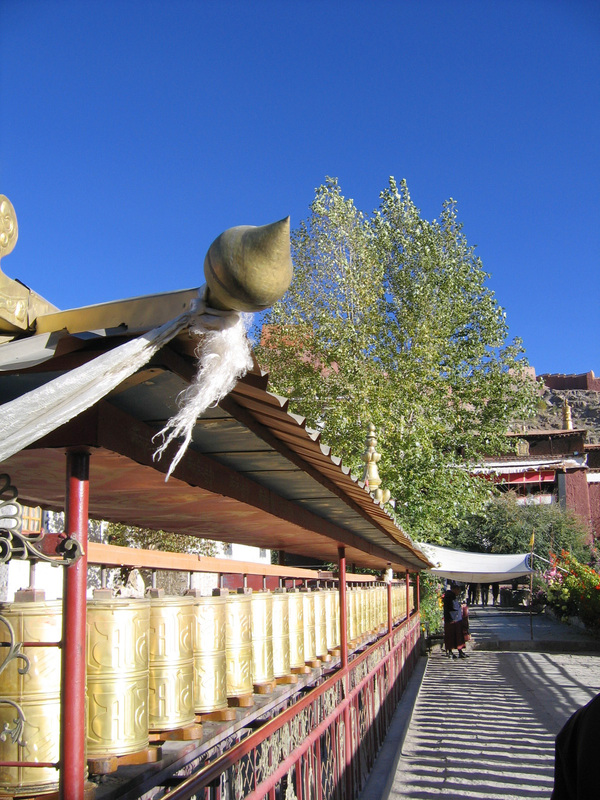 Have you walked the kora around the Jokhang temple? Tell me what you’ve seen! After doing a round of Kora, I decided I needed another break. The smell of yak butter burning makes you thirsty. I checked out another rooftop terrace and met some great people. I wanted to visit the inside of the Jokhang Temple, but had some trouble finding the entrance. After a while, a small girl takes my hand and shows me the way to the entrance. I enter a dark and gloomy place. No natural lights, only small yak butter candles adorn the place. Everywhere you look, you see the small flames dancing in the butter. I’m spinning some prayer wheels round, when I’m passed by some nuns. They are in a rush and on a mission. All routes inside the temple lead to the holiest of the holiest. The centre of the temple is formed by a shrine with the Jowo Rinpoche statue on it. When I got there, all madness broke loose. I had never experienced such religious exhilaration. In a small space, hundreds of people were cramped together. This young woman, a small child on her arm, a young daughter on one hand and her elderly mother on the other, was crying and yelling in ecstacy. People were waving billets of 100 Yuan around, throwing flowers and incense at the statue. I hardly took a look at the statue. It was absolute madness to pass the crowds as people were pushing and shoving, yelling and tearing at their long dark braids. I never felt more out of place. I felt an outsider. I felt awful for being in the way of these people. I was just a tourist, and for these religious Buddhists, this was the reason of their being here. I made way quickly. I left the temple, silent and flabbergasted. I’m not religious myself and I do not worship any god or idea. I felt like I was missing something. I felt jealous of those people so devoted to their beliefs. They seemed to have so much wisdom and faith. I decided to clear my head and went up for some fresh air. You can climb the roof of the temple. 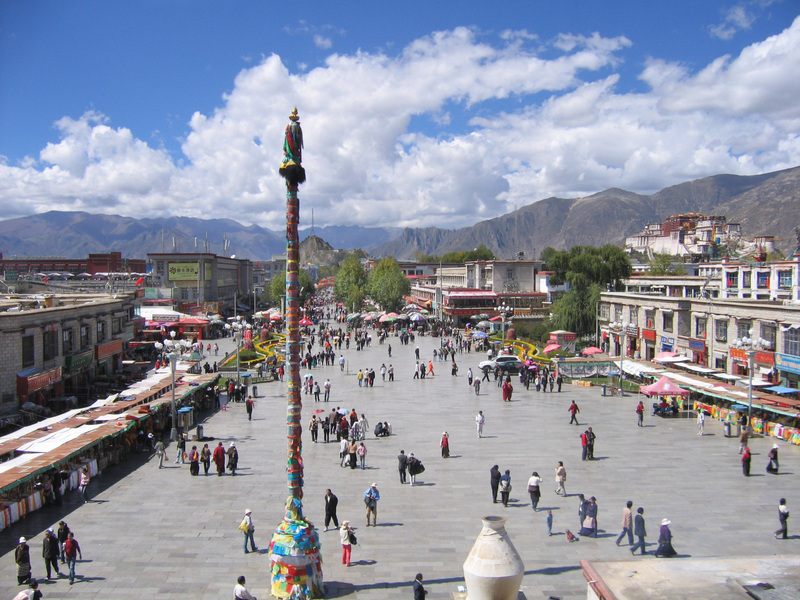 This really gives you great views of Lhasa with the Potala Palace on one side and the Barkhor square beneath you. The sun was beating down on me and nothing but bright blue skies as far as you can see. What a miraculous place. 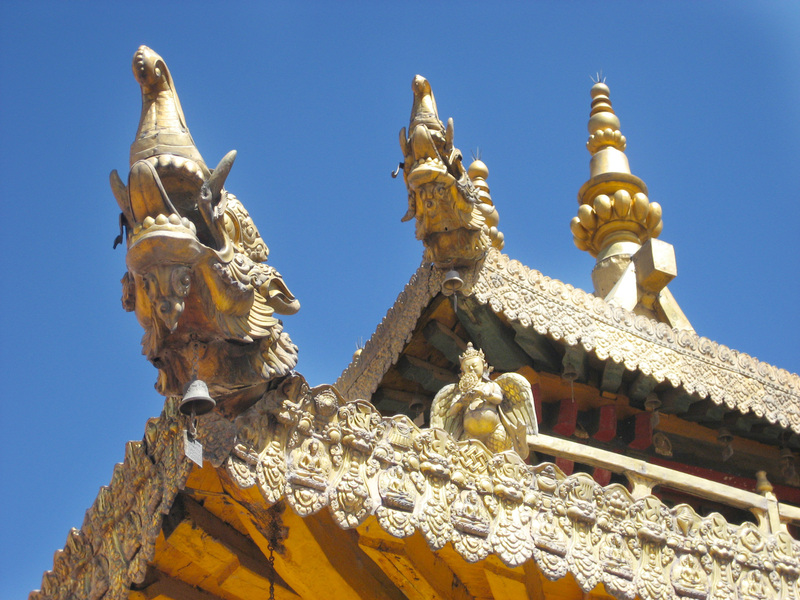 Have you been inside the Jokhang temple? What did you think of it? In hindsight, I wish I’d stayed longer in Lhasa. There was so much more to explore and encounter. The markets, the little shops, restaurants, more temples. But.. the great outdoors of Tibet were calling my name, so I decided to book a 2 day trip to Lake Namtso. 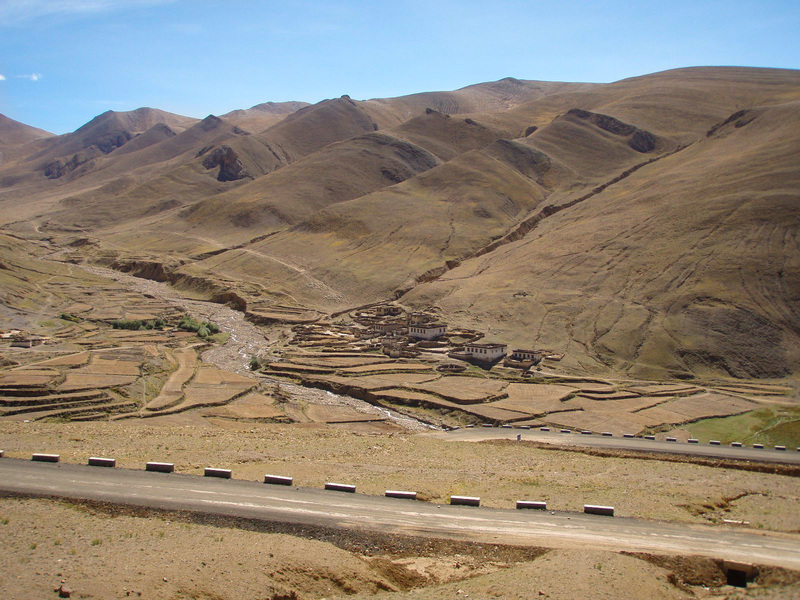 Only a few hours by bus, this is an easy excursion from Lhasa. You can go there and back in the same day, but I decided to take the 2 day tour. We were rounded up like cattle and were put on a tour bus. We got a few stops along the way, but the best place was at Laken Pass. At 5,190 m (17,030 ft) it really is a mind blowing stop. The wind blows your off your socks and your head feels like it’s going to explode! You’ll have amazing views of the lake in the distance. After the pass, you’ll head down to the lake. At an altitude of 4,718 m (15,479 ft) it’s known to be the highest salt water lake in the world. We were dropped at a small settlement of tents where I sought out my stay for the night. I wandered off towards the lake, where young children were begging for a few pennies and adults offered pictures of dressed up yaks. The lake was lovely. I already saw it from the train, but up close and personal it was really amazing. The surface was so deep blue and the sun put little sparkles on each little wave. The mountain range in the backdrop added a dramatic effect and for a moment, I forgot about the headache. The night soon came and this was a night to remember. I ate some bad noodles and spend many hours outside, walking towards the toilets or throwing up. It was a clear night. That made it colder, but the sky was dotted with bright stars. I remember looking up and the longer I looked, the more stars I could see. All of a sudden, one star dropped from the sky, leaving a small trail behind. It was a falling star! My first ever! I was exhilarated with this overwhelming moment. The next day, our tour group returned to Lhasa and we spend the day touring around the Tibetan countryside. Numerous adobe houses with Yak poo stacked against the walls. Juniper branches in every chimney and everywhere people are travelling. Trucks, cars, horse and carriage or on foot, people doing their daily business. Back in Lhasa, I ate again a delicious Yak Burger (sorry Yakkies) and prepare myself for the next journey. I’ve booked a tour together with Bob and two New Zealanders. We will go by 4×4 to the border with Nepal and travel to Kathmandu. 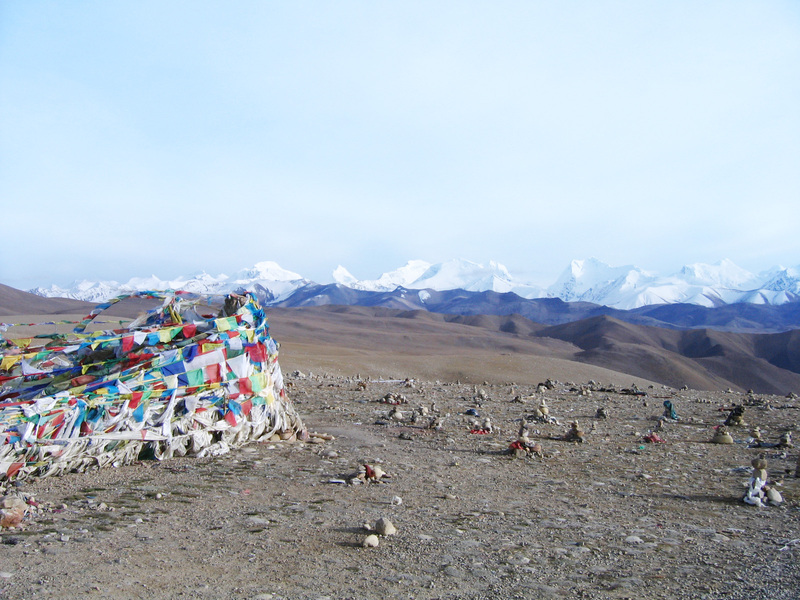 Along the way, we will visit some Tibetan towns but the peak of our trip (literally) will be a night at Mt. Everest Base camp. Whoop Whoop. I can’t wait! We head out with the 4 of us, our driver and a young fellow, who supposed to be our guide. A guide is mandatory for travelling in Tibet, so we have to take him. Our first stop of the day is at Yamdrok Lake. 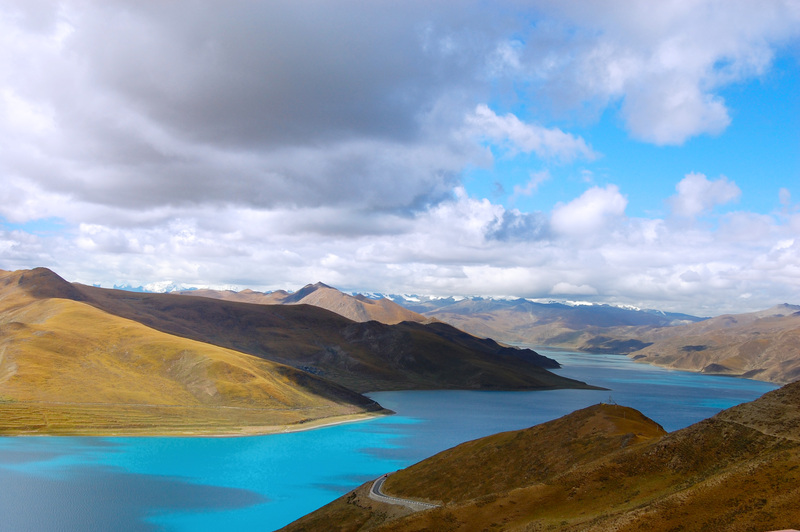 It’s a fresh water lake and among the top 3 largest sacred lakes in Tibet. 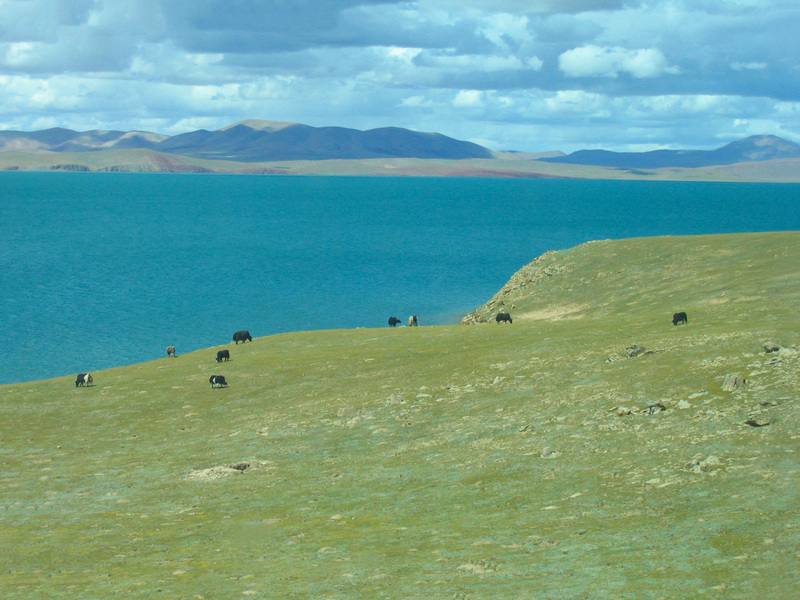 Yamdrok Lake is nothing like Lake Namtso. 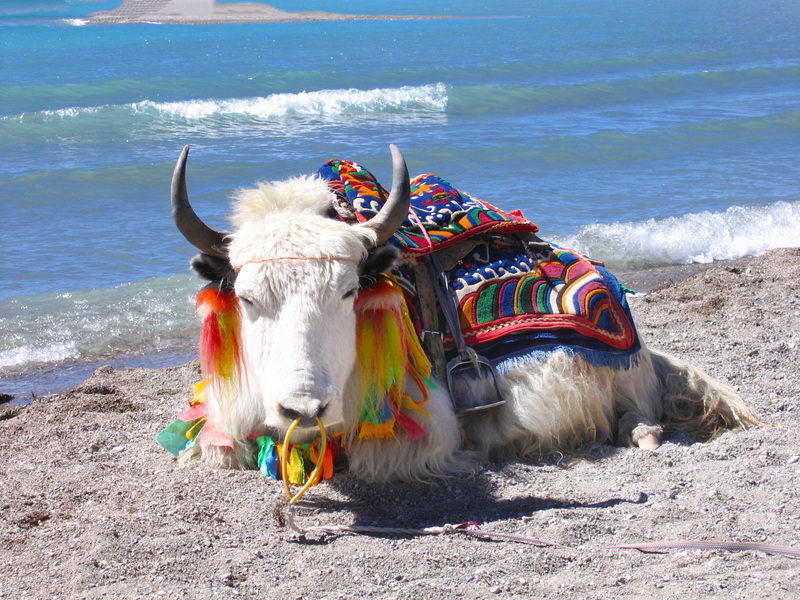 This lake has a turquoise colour of blue and we goof around with some dressed up yaks. After a quick stop, we continue on the Friendship Highway towards Gyantse. We pass many fields on our way to Gyantse. It’s the beginning of October and the golden hay has to be brought in. Numerous people are working the fields. As our 4×4 passes, man straighten their backs and look up, while woman glare at our vehicle from under their stray hats. We arrive in Gyantse and settle in a hotel and treat ourselves to some delicious yak burgers. The next morning, we visit the Stupa of Gyantse. In the background we see the Gyantse fort and climb to the top of the monastery. Here we check out the murals and turn some massive prayer wheels. Next stop on the way, is Shigatse. We break for lunch here, while our guide arranges some permits to travel further into Tibet. We are being entertained by some children in the park who giggle and run around us in circles. We do not have time to visit the monastery with the seat of the Panchen Lama (2nd in command after the Dalai Lama) but if you get the change, check it out. Entertaining or being entertained by the local children? 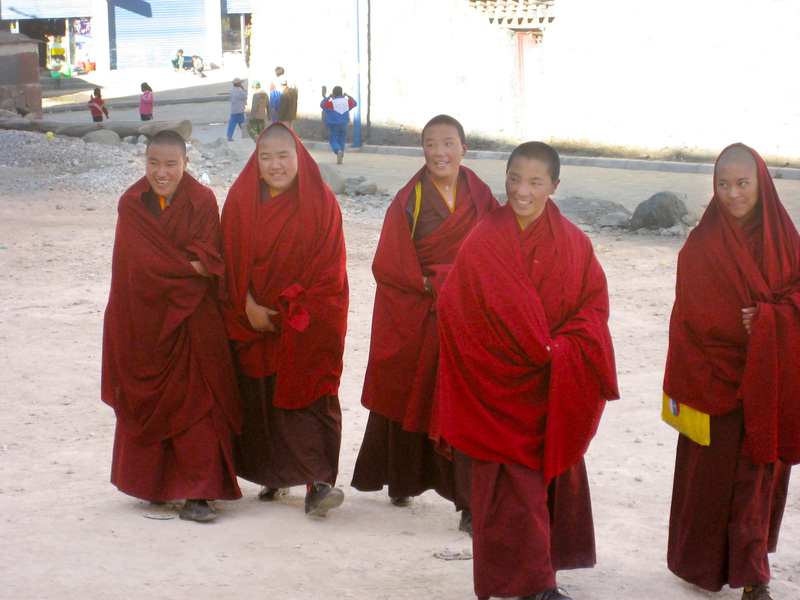 Have you visited the monastery of the Panchen Lama? Please share your story with me. After the permits are arranged, we travel onwards to Sakya. Sakya also has a big monastery as it’s 1 of the 4 major schools of Tibetan Buddhism. We attempt a walk in the hills but the local youth is much more entertaining. The school has just finished for today and we’re being surrounded by young and eager children, giggling and laughing in an attempt to speak 1 world of English. I love this picture. It was taken by my travel friend Bob. The nuns are actually looking at me. The next day, we have a big day ahead of us! We’ll visit Mt. Everest Basecamp! Whoo hooo! Are you excited? We sure are! It’s my turn to ride shotgun in our 4×4 and what a good day it is. 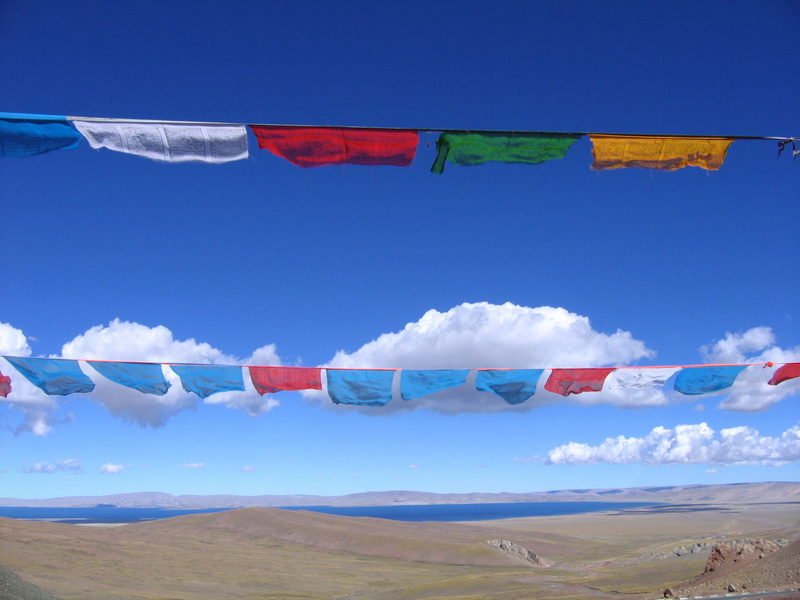 Along the way, we stopped at Gyatso La Pass at 5,248 m (17,125 ft) and I hang my prayer flags here. I feel so excited. 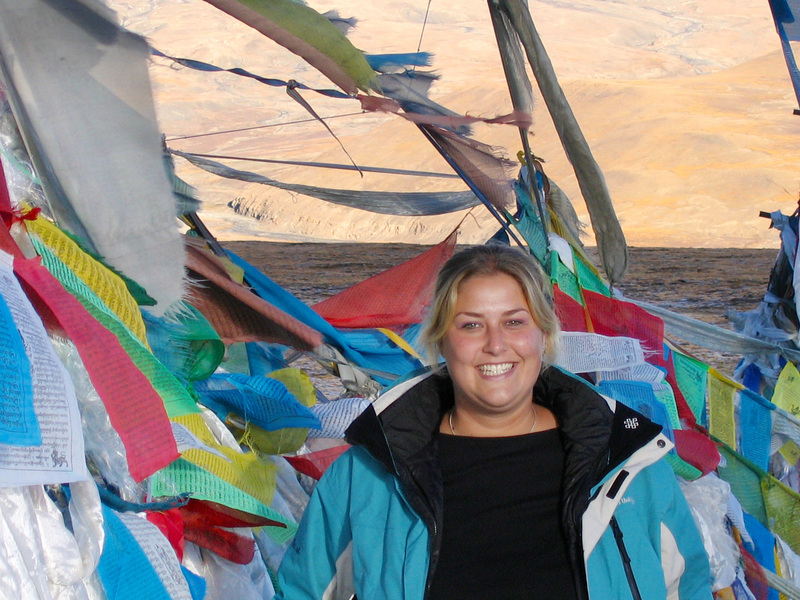 Back at home, I dreamed of travelling to Tibet and hanging my prayer flags in the wind, and here I am, doing it. Fulfilling my dreams. Putted up my prayer flags. Happy! 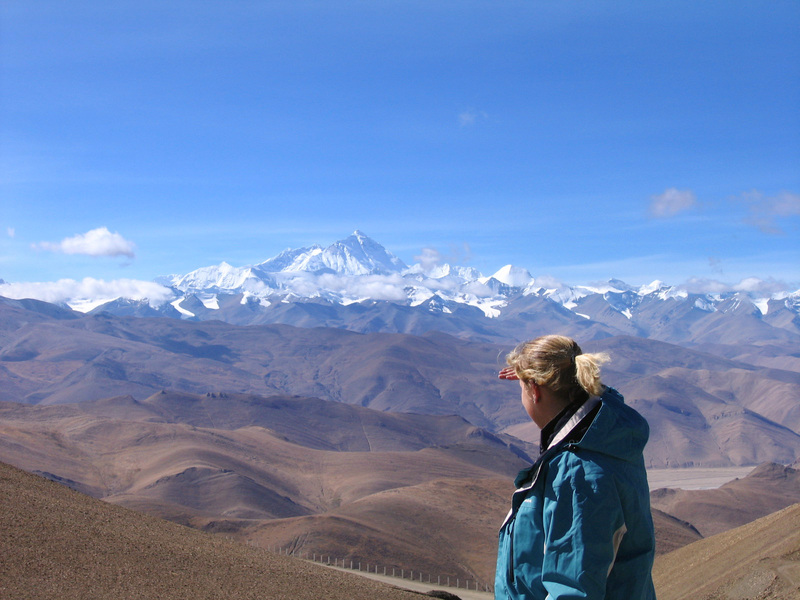 We enter Qomolangma national reserve, home of the Himalayan Mountain range and Mt. Everest. Or Mt. Qomolangma as it’s known by Tibetans. It gets quiet in the 4×4. After each turn, we all stretch our necks, to see what’s behind the corner. The driver tells us, it won’t be long now. We drive on. Silent. Face against the windows. Almost there. We ride up on a hill and all I can see is the nose of the car. We’re at the top of the hill and we head down, but what lays before us, is something so amazing. We all gasp for air and unanimous a sound of “owh!” runs through the car. I’m in the front of the car and before me I see a massive area of green, brown and orange land. But at the horizon is a massive wall of white granite and ice. The wall has jagged teeth sticking out towards the sky, higher and higher. We’re already at 4,800 meters but what we see before us, is even higher. I can’t keep my eyes of the mountain range. From the left to the right, nothing but grey rocks and snow covered peaks. This is it! The highest mountain in the world. Right there, in front of me. A little tear pops up in the corner of my eye. I tell myself it’s the wind. Of course. We stop and take some pictures and just stare at the mountains. I never imagined how they would look. Sure, Mt. Everest is the highest mountain in the world. Ok, but what does that mean? It just means, that Mt. Everest is the winner for collecting the most meters or ft. Vertically. But as the mountain range lay before me, I can see it. 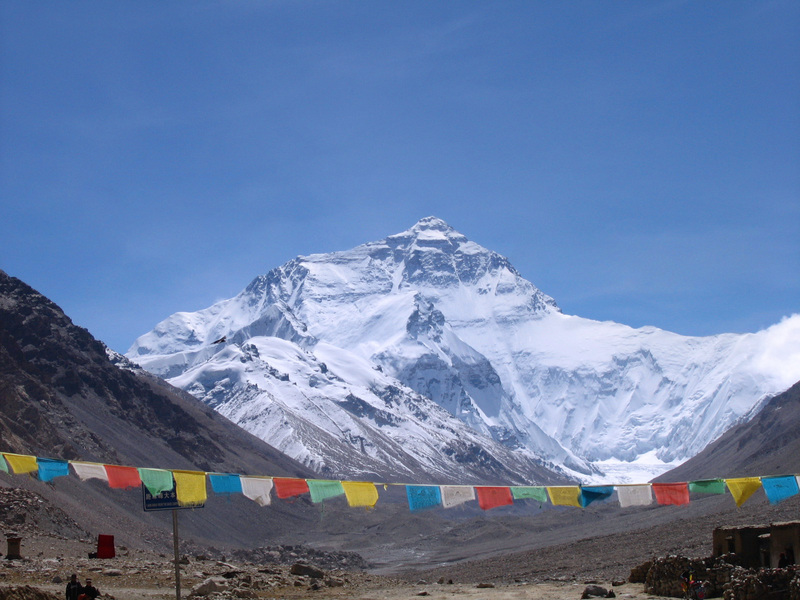 The peak of Everest is towering over the rest of the little hills surrounding it. What a remarkable sight. It takes us another 2 hours of driving towards Mt. Everest Basecamp. The road is winding and everywhere we look, we have amazing views of the Himalayan Mountains. Each corner we take, there is a new light, playing on the field and surrounding the area. When we finally arrive at our stop for the night, we get out of the 4×4. On both sides of the street are big tents and we’ll stay in one of them tonight. But where we sleep doesn’t really matter, as we want to get even closer to the mountain! We’re heading out to Everest Basecamp!! Camera? Check! Batteries? Check! Off we go. The peak of the mountain is covered in clouds but it really seems that luck is on our side, because as we approach and enter the actual Mt. Everest Basecamp, the clouds thin out. I climb the little hill that marks the photo spot. Climbing might not be the good word, I’m struggling. I’m no way near fit enough to do this. I had food poisoning twice in the past 3 weeks. I’m overweight and I have a chronic disease. But I’m here. I made it. I’m standing at Mt. Everest! And yes, there are the tears again. Unfortunately, I can’t stay long at the little hill. The wind is really blowing me away and I can’t think straight with all the prayer flags flapping ferocious in the wind. I take a few pictures and I cannot seem to wipe the smile of my face. As I wait, all clouds completely disappear and Mount Qomolangma shows herself in all her naked beauty. I see some snow being blown from the top and I’m trying to take it all in as much as possible. But I have to head back. My head is exploding, I’m shacking and my hand are freezing. 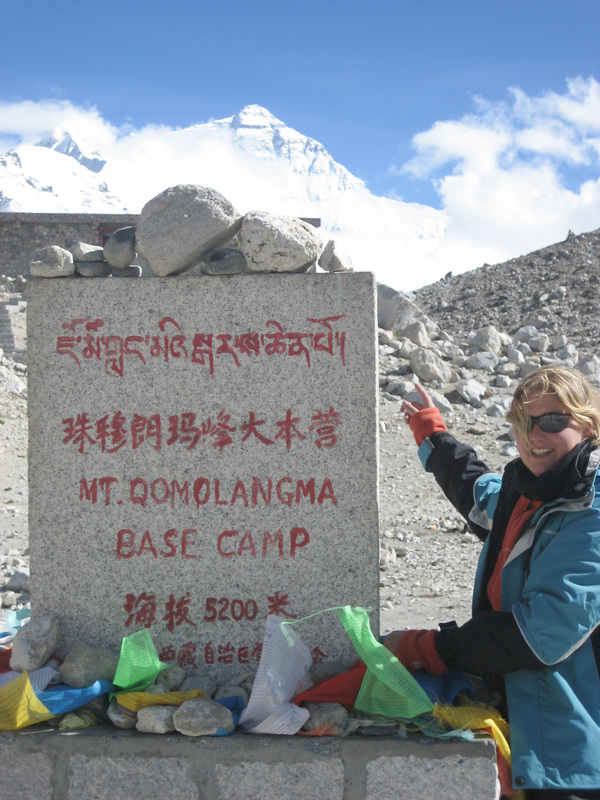 I’ll go back down and take some last pictures with the stone marking the spot at Everest Basecamp. Once back in our own camp, I have a nice hot cup of tea and in the afternoon, I head out again to see the sun setting behind the mountain. The whole area is touched by a magic soft glow of purples and pinks. In our tent, there’s entertainment by the young little boy from the family we’re staying with. He is adorable and more than cute. We eat something, talk a bit and finally settle in for some sleep. Of course, it’s cold. And uncomfortable. And I have to pee. Again! Sure, a good remedy for altitude sickness is drinking loads of water. But what goes in, must come out. I head out of the tent and find a secluded spot somewhere away from the tents. I’m concentrating on squatting down and not trying to pie on my shoes, but when I’m done, I get up. And look around me. Dark skies, adorned with millions of stars. And at the end of our gorge, the white dame. Mt. Everest. Looking down on me. I’m overwhelmed by the grandness of nature and feel very lucky to have seen this in the middle of the night. In the morning, the whole sky is grey. Left, right and above us. We can’t see more than a few miles in front of us and we’re so lucky to have seen Mt. Everest the way we did yesterday. That’s also nature. We pack up our stuff and head out again. Bye Mt. Everest, you’re truly majestic. Have you been to Mt. Everest? Did you have clear skies and sweeping vistas of the mountain too? Please share your stories with me. After Mt. Everest we head back to the old road and we want to make a long haul to the border. This is very tricky as the road can be flooded, blocked or you get stuck in immense traffic. For us, this day is very confusing. It seems like our guide is not very honest with us and the driver is in a bad mood. Nevertheless, we decide to continue onwards to the border with Nepal. We leave Tingri behind and have a lot of hairpin driving in front of us. Much of the road is covered in running water from the mountains. We have to clear the road twice due to rocks blocking our path. Once night falls, things get even more absurd and I now understand why the driver didn’t want to do this today. But we’re on this road now and we can’t go back or stop. We have to continue onwards to the border. At 10 o’clock at night, we reach the end of our journey through Tibet. We can’t go any further and our driver is furious. We take quarters in the most awful place ever, but we have to take it. And that was it. My trip around Tibet will end the next day, when I cross the border into limbo land until the border with Nepal. I have seen some amazing places, had so many highlight in my trip. Tibet is really an amazing place with wonderful people who are struggling to maintain their uniqueness under Chinese influences. 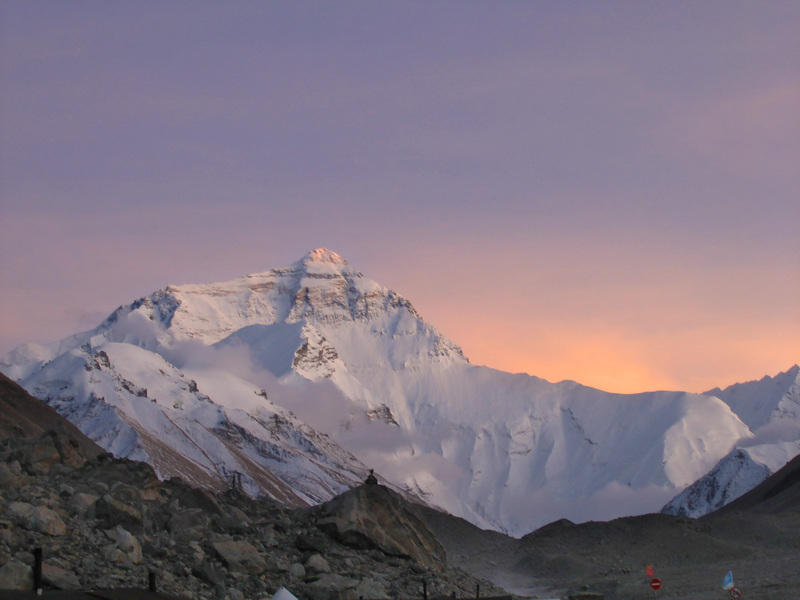 On this tour of Tibet you may visit Mt. Everest (8844.43m) at Everest Base Camp (5.200m). If you have more time, you may move back from Shigatse to visit heavenly Namtso Lake or exploring holy Mt. Kailash in Ngari. 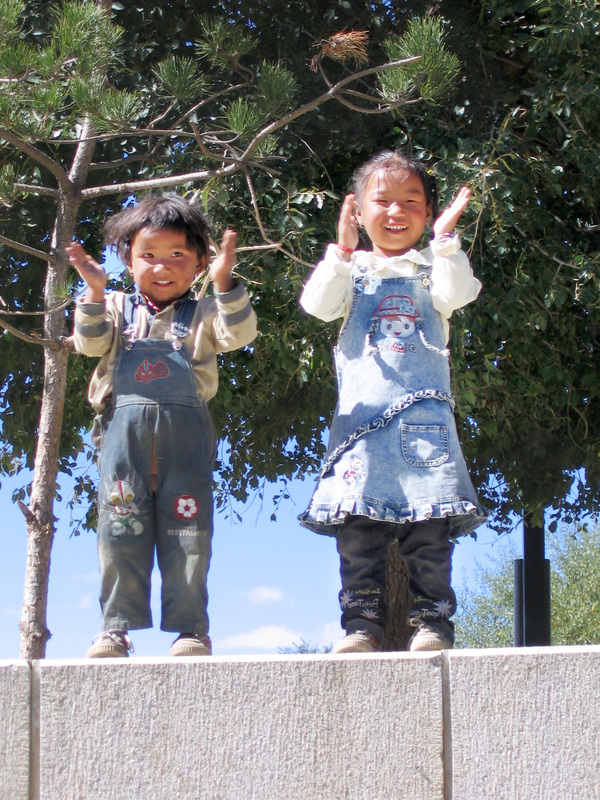 If you like to see more images of the Tibetan people, check out my blog: People of Tibet. My trip wasn’t anything like the movie, Seven Years in Tibet, but I hope you liked my account of 7 Days in Tibet. Have you been to Tibet? What are your experiences? Please share them in the comment section below. Hi Elsa. I went without a guide but it was a long time ago. Check the current situation for guides and permit applications. Really the great post. 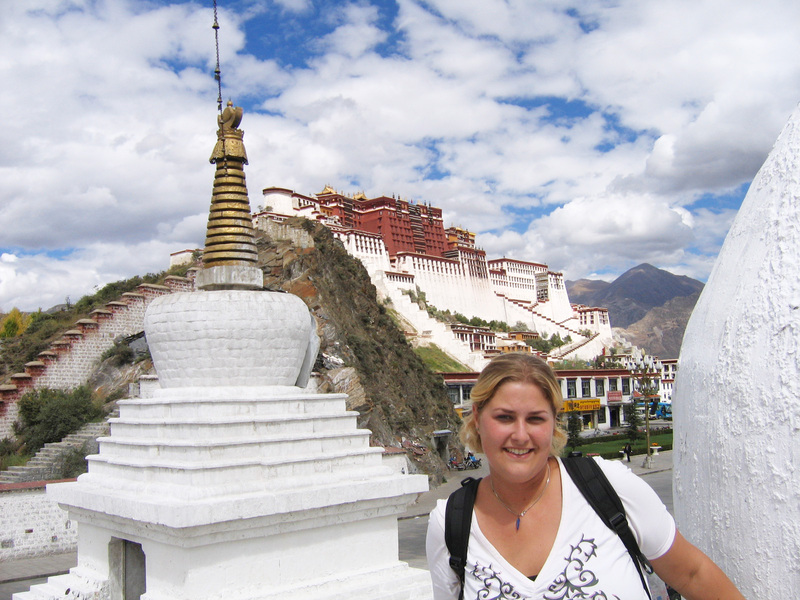 I like to explore Tibet and visit the tourist places. Thanks for sharing your blog. Travel makes the moments happy and memorable. Love your post. I visited Potala Palace two years ago, and I really enjoyed the inside of it, the architecture, the decorations, the paintings were splendid, I admire those craftsmen, and I don’t remember anything about Chinese guards, anyway soul and spirit resides in our heart, not in the outside world. We had lots of trouble getting into it though, because we didn’t know the number of visitors is limited and people need to book it in advance, and the smoke from the gigantic burners hurt my eyes. I enjoyed my trip to Tibet but if I’m visiting there a second time, I think I will stay in Lhasa, public toilets for tourists in remote areas terrified me. Hi, how much was the cost for the trip excluding flight from you homeland. I didn’t fly to Tibet but took the train Sneha. It was too long ago to remember an exact number but the Everest permit and the tour to go overland to Nepal where the most expensive things. All in all, lodging and food was not that much I remember. I am from India and it has been my lifelong dream to visit Tibet. But I dont know if I ever could. How easy was it for you to get the visa? I have heard the Chinese are a paranoid lot and they would definitely not like an Indian coming into ‘their’ precious Tibet. I have no idea what it is like for Indian residents Kuheli. When you apply for your Chinese visa, you do not mention Lhasa or surrounding as your destination. I hope you can fullfill your dream. This sounds absolutely amazing! What a dream come true! Thank you Alice! It was. Wow….this looks like a dream. I’m convinced. Although the list of places off of my bucket list is far shorter than the list itself, you just helped to raise Tibet up by at least a few notches!